Water based oil and water repellent for all surface protection. Use on carpets, upholstery, vinyl, leather, wood and painted surfaces. 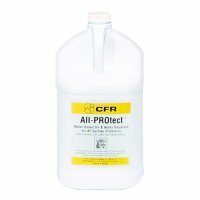 • ALL-PROTECT™ is a water-based product containing a fluorinated acrylic co-polymer. • ALL-PROTECT™ is based upon entirely different chemistry than that used in the manufacture of Scotch Guard products. • Contains no aromatic solvents – safe to use in all environments. Why Crystal Clean Norfolk uses CFR ALL PROtect? • Provides excellent water and oil repellency to carpets, upholstery and a variety of surfaces. • Reinforces / Maintains the protection provided by mill treatments with fluorochemicals. • Effectiveness is readily demonstrated. • Facilitates wet and dry soil removal. • Works on virtually all natural and synthetic fibres. • Costs as little as pennies per square foot for typical applications. • Maximum benefit is achieved when ALL-PROTECT™ is applied to clean carpets or fabrics. Let us apply ALL-PROTECT™ to protect your carpets and furniture fabrics from everyday spillage stains. In addition dirt and grit will not stick to the fabrics or fibres thus making cleaning easier! Great for carpet, sofa suite and rug protection. It's not as expensive as you might think! Any Faux leather suite or sofa can also be treated. Carpet Rug Suite & Sofa Cleaning for Norwich, Wymondham, Attleborough,Thetford, Diss, Eye, Harleston, Bungay, Beccles, Lowestoft, Acle, and all Surrounding Villages.